#hopeforJose. This is the story of 2 years old Joseph (Jose) Gergess. 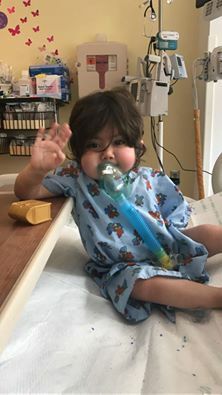 Jose's family has issued a call for help throughout the Lebanese media, public figures, politicians and social media as this adorable 2 years old baby boy is in urgent need of an 850,000$ bone marrow transplant. You can find more on "Hope for Jose" facebook page and using the hashtag #hopeforjose on social media. We're only two weeks away from Christmas. If you wish to do good this season, now is the right time. Jose is currently at the Cleveland Clinic Children's in USA. Quote from Jose's father, Roy Gergess: "Joseph and his mother travelled from Lebanon to the USA on September 12th for an appointment with Dr Fariba Rezzae (Pneumologist - Cleveland Clinic) because Joseph has been suffering with Pseudomonas Pneumonitis and was intubated and on respiratory ventilation for the last 2 years. After almost three months of continuous tests and hospitalization, the doctors concluded that Joseph is suffering from a Severe Combined Immune Deficiency (SCID) due to a mutation in gene SP110 that leads to life-threatening liver fibrosis. The only cure for the SCID to prevent liver fibrosis is allogenic bone marrow transplant from a healthy donor. The cost of the hospitalisation and physicians services (From 12/09/16 until 1/12/16) are 727,870.50$. In addition to that, the estimated cost of the transplant is between 750,000.00$ and 1,000,000.00$ leaving us with an overdue of approximately 1,700,000.00$. After applying 50% discount on the bills since Joseph is an international patient, we need to secure the amount of approximately 850,000.00$ in order to give Joseph a new chance in life. All the documents are available on the dropbox link below. Roy, Jimmy and Joseph Gergess"